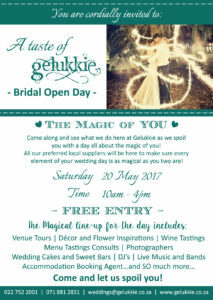 Taste of Gelukkie Bridal Open Day! A day for existing and potential Gelukkie Bridal Couples to come view Gelukkie in all her glory! Local service providers from make-up to music will be there offering consults and special offers. Food and wine tastings form our menus will also be on offer throughout the day! The perfect day to come and plan your whole wedding day at Gelukkie! !